The battle for new delivery business spurred by the significant rise in large products ordered online is officially on. And as consumers get more comfortable buying larger items like appliances, grills, treadmills and even furniture online, trucking companies like JB Hunt Transport Services Inc. are knee-deep in the fray to secure the ensuing delivery business that comes with it. 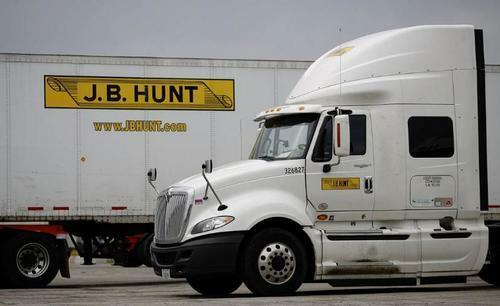 JB Hunt, for instance, announced Wednesday that it has agreed to pay $100 million for a company in New Jersey that specializes in delivering large items to consumers. This is the second such purchase made by JB Hunt in the delivery space in less than two years. Similarly, XPO logistics has made four acquisitions of this nature to try and implement what it is calling a "white glove service". Ryder System Inc. also spent $120 million last year to purchase a company that would bring in an additional 109 e-commerce fulfillment facilities and 72 third-party centers. The market for these types of deliveries is up about 10% from last year, according to SJ Consulting Group. The total market is valued at about $8.9 billion. This is a significantly faster rate of growth than regular freight and it is anticipated that it will continue to grow rapidly, as younger people start to age and take on bigger purchases. The need for the delivery niche also arises from online merchants who want pricing and tracking options similar to FedEx and UPS, who are not efficient in delivering the larger items. One merchant recently profiled in a Bloomberg writeup, BBQGuys.com, ships its items from Louisiana all over the country and gets more than 70% of its $115 million in annual sales from larger items. The company has tried to offer delivery with installation but inconsistencies among the industry have made it difficult for them. This need for consistent delivery is what has created the opportunity for these trucking companies. At Ryder, the company tries to provide consistent nationwide coverage with their partners, while using volume to offset high delivery costs. The technology it has recently bought allows customers to pick their own delivery times, one of several capabilities that aren't available with traditional shippers or small independent truckers.